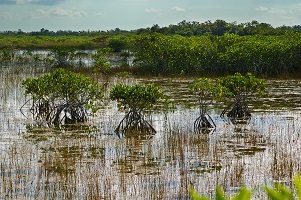 Section of the Florida Everglades frequented by SCP-3243. Special Containment Procedures: An area of the Florida Everglades National Wildlife Refuge has been purchased by the Foundation, under the guise of a private philanthropist-funded conservation effort. A research cabin has been established in the area most frequently visited by SCP-3243 and is currently staffed by three research personnel and one containment specialist with experience in invertebrate biology. This cabin is to receive monthly allotments of supplies from nearby Foundation sites. The research staff is to conduct various experiments on water and air quality, as well as compile indexes of plant population and health to aid in conservation efforts. Reports of these experiments are to be made available to any local inquirers who happen to encounter Foundation personnel elsewhere in the Wildlife Refuge and express interest in the private activity occurring. Any trespassers on the Foundation-held land are to be turned away under the guise of maintaining the delicate natural ecosystem and scientific conditions of the area. Research personnel1 are to meet with SCP-3243 twice weekly, and carefully document all interactions with the entity. Field cameras have been installed in nearby trees to monitor the entity's location. Requests may be made weekly for additional materials to aid in SCP-3243 containment, including fertilizers, plant seeds, saplings, and curriculum to teach reading. Care is to be taken to avoid inadvertently stepping on SCP-3243-1 instances. Description: SCP-3243 appears to be a genetically-unique member of the species Limax maximus (great grey slug), measuring 3 meters long and 1 meter wide. SCP-3243 possesses two 1-meter-long forearm-like appendages, terminating in hands with two fingers and opposable thumbs, which allows it to communicate in rudimentary sign language. SCP-3243 has two black eyes on its eyestalks, both of which are 5 centimeters in diameter. The coloring of SCP-3243 resembles that of its apparent species, consisting of a gray skin tone mottled with brown and cream spots on the stomach which allow for camouflage. SCP-3243 currently resides near the Shark River area of the Florida Everglades. SCP-3243 has demonstrated an extensive knowledge of medicine-making utilizing natural ingredients, as well as familiarity with various aspects of wilderness survival; this has been observed in SCP-3243's interactions with civilians (often those involved in boating or swimming accidents) prior to Foundation intervention. SCP-3243 generally exhibits a placid demeanor and seems to regard humans with curiosity, often floating in the water and trailing scientific research and conservationist vessels from a distance when they pass. Possibly due to its physical shape, SCP-3243 rarely travels more than 30 meters from its usual resting spot in an average day. The skin on SCP-3243's back is almost entirely covered with a layer of moss and greenery measuring 6 centimeters at thickest. The entity is believed to carry a complex miniature plant-focused ecosystem on its body; various species of grasses, ferns, and reeds have been identified from samples2. In addition to consuming swamp detritus, SCP-3243 is believed to subsist off of the metabolic outputs of the photosynthetic plants on its back. SCP-3243 has been observed to carry decomposers upon itself as well: as dead plant matter accumulates, various mushroom species will manifest. When this occurs, the decomposing plant matter will sometimes animate, forming autonomous simple humanoid figures which fulfill roles as caretakers or servants for SCP-3243. These miniature anomalous entities are classified as SCP-3243-1, and possess no identifiable features aside from their varied plant base composition. Each SCP-3243-1 instance has been noted to possess a mushroom cap atop its head. The first documented sighting of SCP-3243 occurred on July 23, 1994, involving locals describing a "giant swimming garden" in the Everglades fending off an alligator to allow a young child to escape to safety. Within weeks of the first sighting, expeditions led by the grateful family and curious acquaintances led to the consideration of SCP-3243 as a local legend. Repeated civilian attempts to locate SCP-3243 remained inconclusive, and eventually its existence became known as a guarded secret, with community reverence for the supposed "monster" becoming an unremarkable normality. During this time, the Foundation was made aware of SCP-3243's alleged existence, but did not initiate any surveillance or recovery attempts until an incident occurred on August 4th, 2009, involving SCP-3243 directly interacting with a civilian. During the event, two individuals, locals of the area, were engaged in barefoot waterskiing when their boat's engine failed. The waterskier, ████ ██████ (age 19), had accelerated beyond the boat and whiplash caused his arm to dislocate. Upon making contact with the shallow water, ██████ suffered a fractured left tibia. He was then thrown far enough that his companion, ██████ █████████ (age 56) was unable to locate him. Several minutes later, SCP-3243 is reported to have encountered ████ ██████, and then carried the unconscious individual on its back to his companion's boat. ██████ █████████ then quickly returned his companion to the mainland to seek medical attention3, reporting the sighting to local law enforcement, prompting further Foundation investigation. After three months of scouting, Foundation operatives located SCP-3243 and began preparations to establish containment. Addendum SCP-3243-1: When contact with SCP-3243 was first established, Dr. Hunter Miles (assigned to the case as of 04/09/2010) had begun attempting to approach SCP-3243 via airboat by following SCP-3243-1 instances congregating nearby. SCP-3243 exhibited a familiarity with common hand signals used by waterskiers, using its appendages to form the "I'm okay" and "stop" signs in response to questions in the yes/no format. Over the course of the following conversation, Dr. Miles was able to determine that SCP-3243 appeared to possess a high level of intelligence and comprehension, and associated humans with the recent conservation efforts occurring throughout the Everglades area. Prior to Dr. Miles returning to the cabin to prepare his daily report, SCP-3243 swam closer to the airboat and proceeded to point at Dr. Miles's ID badge, the lettering on the side of the boat, and then itself in succession. After additional conversation, Dr. Miles interpreted this as a request to be taught how to read, and promised SCP-3243 he would return. Addendum SCP-3243-2: As of 12/26/2013, SCP-3243 has shown significantly rapid development in reading comprehension and has begun to request writing implements from Dr. Miles. The Foundation has since provided a set of eco-friendly writing pads and styluses for SCP-3243, which it currently stores on its back. In a recent meeting with SCP-3243, Dr. Miles was presented with a garment made of woven reeds, resembling a life vest. When asked what the purpose of the item was, SCP-3243 gestured to Dr. Miles's ID card, and then proceeded to write the word "protect" on its writing pad. Analysis of the garment has identified an anomalous effect incorporated into the woven pattern of the reeds (though the organic material of the item seems non-anomalous). Further testing has indicated that the vest is resistant to rot, lightweight as well as buoyant in water, and possibly bulletproof. Further investigation of the weaving pattern and whether it can be replicated for Foundation use has begun. It has been noted that when Dr. Miles indicated interest in learning from SCP-3243 how to make the vests to "protect his friends", SCP-3243 immediately exhibited excitement. It then instructed SCP-3243-1 instances to begin removing reeds from its back to demonstrate the construction of a preliminary woven pattern. Site Director Shenberger has approved Dr. Miles's request to wear the vest during every subsequent visit to SCP-3243 as a show of good faith and respect. 1. The current primary contact for the SCP-3243 case is Dr. Hunter Miles, Cryptozoology dept. 2. Of note, some of the plant species observed on SCP-3243 are variants of ferns and orchids believed to have gone extinct in the recent decade. 3. Per medical records, ████ ██████ had stated he did not feel any pain upon initially arriving at the hospital, despite his injuries. Hospital staff were not able to determine the cause for this. Mr. ██████ later made a full recovery.